[img]I have a 1998 Aqua Patio 24' boat. The boat is stripped to the deck and am replacing the carpet with vinyl. The engine mount currently is about flush with rear of the pontoons and the deck has a large cut for the outboard to tilt into. I'd like to move the engine mount rearward to eliminate the cut out. Then the space will be used as a small deck. The outboard is a 2003 Mercury 40hp 2 stroke (about 170 lbs). Aside from replacing the interrupted aft cross member with a continuous member and longer steering/shift/throttle does any see potential problems? The fence on the starboard side will be modified and sun deck eliminated. Port side fence encloses the fuel tank so that will be retain and the cushion on top removed then covered with vinyl. Any input would be appreciated! Leave it like it is. The cutout muffles the.sound.of the motor. I have a Starcraft styled like it, and my Yamaha 115 horsepower two stroke planes at 2800 rpm's and is very, very quiet. One problem with small motors is that they are relatively loud because they have to be run so hard. I have to agree with Bamaman! 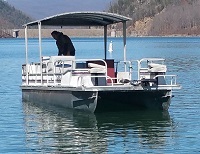 The stern of my pontoon is setup like your picture except that the sun deck above is hinged as one piece. Sound level difference is dramatic with the lid up/down. It really is a huge difference in motor and water noise on my boat. Plus, I use the "shelf" above the transom for some more battery power in a great center line location to counterbalance a crowd up front! Good point Bansil. The cantilever effect is a consideration. And if the Yamaha 115 V4 (330 lbs) were going back on then a big consideration. Fortunately the 03 Mercury 40 hp weighs around 170 lb which should help that situation considerably. Losing 2/3 of the sun deck (starboard side is currently a tilt up privacy room and weighs 50-60 lbs) will also remove nearly 80-100 lbs. The aft sheet of decking may be replaced with a sheet of Coosa board 26 that I had for another project for more weight savings. Lots to consider. That is a lot of wt savings! I moved my transom back on my restore and eliminated the cutout. Replaced the cutout crossmember with a full. I also went 25 horse larger (115 horse) and added about 100 lbs in motor weight. In about 3 weeks i'll be on the water and i'll let ya know how she does! Also keep something in mind, all the newer motors are taller from the mounting bracket upward. This means when you trim up you have issues hitting the cutout and the sundeck. The new evinrudes can trim up 80+ degrees which makes the issue even worse. IMHO removing the cutout is a good way to future proof your remodel and also gain some serious storage room. I'm glad i did it. With a motor your size and the weight savings you mention i'd have zero qualms moving that transom back. Just reading old posts and curious if this restoration was done and what the result was. Yeah, me too. Considering starting mine and always looking to learn what works and what to watch out for. Sorry folks I didn’t get it in the water this season. Remodel just taking too long. The brides got me redoing the kitchen now so it won’t be in the water until spring. If you remember post back come spring and I’ll update.